↑ 1.0 1.1 Glantz & House 2004, p. 338. ↑ 2.0 2.1 Glantz & House 1995, p. 165. ↑ Bergström 2007, pp. 123–125. ↑ Bergström 2007, pp. 127–128. ↑ Frieser 2007, p. 154. ↑ Glantz & House, p. 276. ↑ Frieser 2007, p. 154 Luftflotte 6 45 losses Luftflotte 4 144 losses. ↑ Bergström 2008, p. 120: ตัวเลข 5–31 กรกฎาคม ให้โดย Generalquartiermeister der Luftwaffe. ↑ 14.0 14.1 Frieser 2007, p. 150. ↑ Dunn 1997, p. p. x. ↑ Glantz 1989, pp. 149–59. ↑ Glantz & House 1995, p. 167. Bergström, Christer (2007). Kursk — The Air Battle: July 1943. Hersham: Chervron/Ian Allen. ISBN 978-1-903223-88-8. Bergström, Christer (2008). Bagration to Berlin — The Final Air Battle in the East: 1941–1945. Burgess Hill: Chervron/Ian Allen. ISBN 978-1-903223-91-8. Carell, Paul; Osers, Ewald (1966–1971). Hitler's War on Russia: V1: Hitler Moves East, V2: Scorched Earth. Translated from the German Unternehmen Barbarossa. London: Corgi. ISBN 9780552086387. Clark, Alan (1966). Barbarossa: The Russian-German Conflict 1941–1945. New York: William Morrow. ISBN 0688042686. OCLC 40117106. Dunn, Walter (1997). Kursk: Hitler's Gamble, 1943. Westport, Conn: Greenwood Press. ISBN 978-0-275957-33-9. Glantz, David M. & House, Jonathon (1995). When Titans Clashed: How the Red Army Stopped Hitler. Lawrence, Kan: University of Kansas Press. ISBN 9780700608997. Glantz, David M. & Orenstein, Harold S. (1999). The Battle for Kursk 1943: The Soviet General Staff Study. London; Portland, OR: Frank Cass. ISBN 0714649333. Glantz, David M. & House, Jonathan M. (2004). The Battle of Kursk. Lawrence, Kan: University Press of Kansas. ISBN 0700613358. Glantz, David M. (1990). The Role of Intelligence in Soviet Military Strategy in World War II. Novato, CA: Presidio Press. ISBN 0891413804. Glantz, David M. (1989). Soviet Military Deception in the Second World War. London: Routledge. ISBN 9780714633473. Healy, Mark (1992). Kursk 1943: Tide Turns in the East. London: Osprey Publishers. ISBN 978-1-855322-11-0. Kasdorf, Colonel Bruno. "The Battle of Kursk – An Analysis of Strategic and Operational Principles" (PDF). U.S. Army War College. Krivosheev, Grigoriy (1997). Soviet Casualties and Combat Losses in the Twentieth Century. London: Greenhill Books. ISBN 1853672807. Mawdsley, Evan (2007). 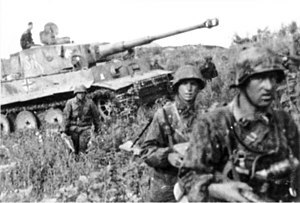 Thunder in the East: The Nazi-Soviet War, 1941–1945. London: Hodder Arnold. ISBN 0340613920. Newton, Stephen H. (2003). Kursk: The German View. Cambridge, Mass: Westview Press. ISBN 0306811502. Nipe, George (1996). Decision In the Ukraine, Summer 1943, II. SS and III. Panzerkorps. Winnipeg: J.J. Fedorowicz. ISBN 0921991355. Overy, Richard (1995). Why the Allies Won. New York City: Norton Press. ISBN 9780393039252. Restayn, Jean & Moller, N. (2002). Operation "Citadel", A Text and Photo Album, Volume 1: The South. Altona, Man: J.J. Fedorowicz Publishing. ISBN 0921991703. Restayn, Jean & Moller, N. (2006). Operation "Citadel", A Text and Photo Album, Volume 2: The North. Altona, Man: J.J. Fedorowicz Publishing. ISBN 092199172X. Robbins, David L. (2004). Last Citadel. London: Orion. ISBN 0752859250. Taylor, A.J.P & Kulish, V.M (1974). A History Of World War Two. London: Octopus Books. ISBN 0-70640-399-1. Töppel, Roman (2001). "Die Offensive gegen Kursk 1943 – Legenden, Mythen, Propaganda" (MA Thesis)|format= requires |url= (help). Dresden: Technical University. Zetterling, Niklas & Frankson, Anders (2000). Kursk 1943: A Statistical Analysis. Cass Series on the Soviet (Russian) Study of War. London: Routledge. ISBN 0714650528. หน้านี้แก้ไขล่าสุดเมื่อวันที่ 1 กุมภาพันธ์ 2562 เวลา 21:01 น.